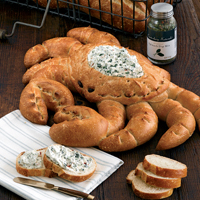 Crab and Artichoke Dip #490 Get a baked crab sent fresh to your home from our bakery at Fisherman's Wharf in San Francisco. 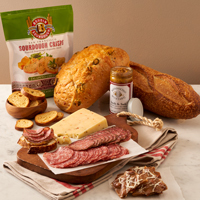 Our fun-to-eat sourdough creation tastes even better with artichoke dip, so we included a .52oz pouch of Gourmet Village Hot Parmesan & Artichoke Mix. Combine seasoning mix with 1/2 cup each cream cheese and mayonnaise, a 13.75oz can artichoke hearts and 1/2 cup grated Parmesan cheese for a sourdough crab and dip feast. Includes two 8 oz. bagutees for slicing and dipping. Recipe included. 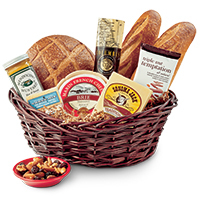 Includes: Handcrafted Sourdough Crab 2 8 oz. Sourdough Baguettes .52oz pouch of Gourmet Village Hot Parmesan & Artichoke Mix. From Donna Downs of Wilmington, Delaware on 11/17/2017 .